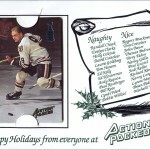 Former trading card company Action Packed had big plans to make hockey collectibles for the 1994-95 season. But those plans never unfolded. 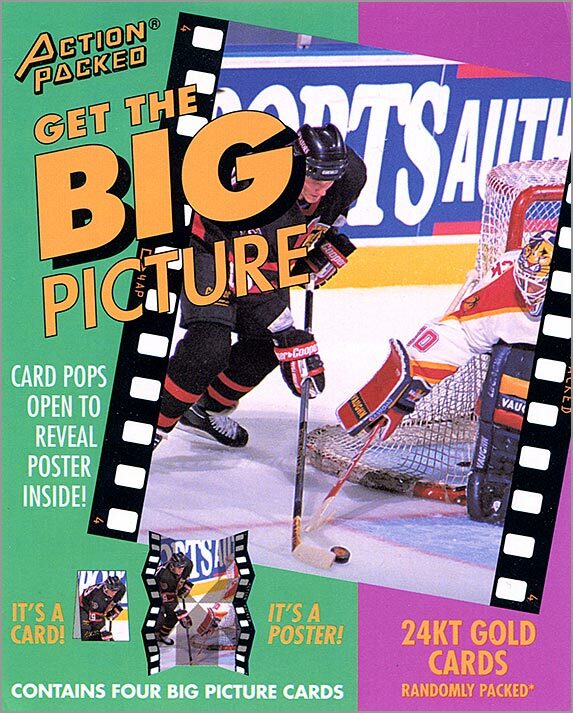 One odd set that was promoted in 1994 but never released was Big Picture, a series of 84 card-sized collectibles that unfolded to reveal a poster. Each Big Picture is constructed of two parts: a cardboard folder hinged on the top and an attached paper poster folded inside. 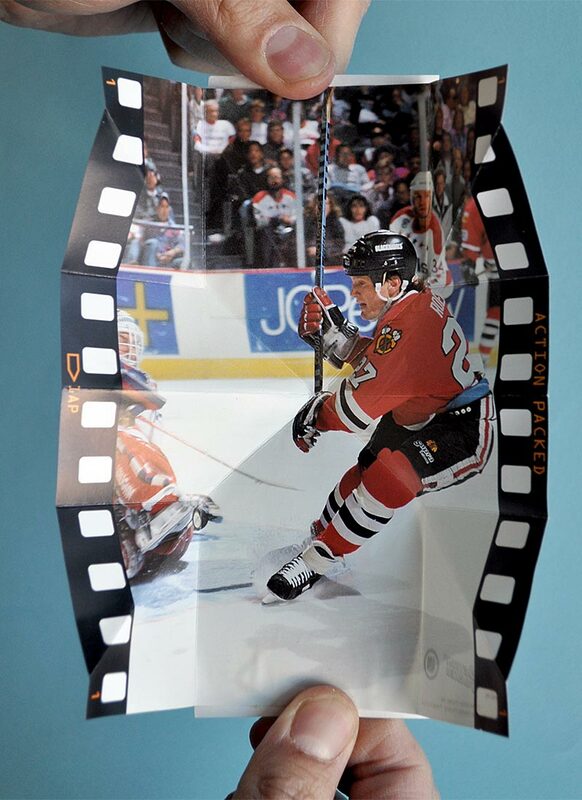 When folded, Big Picture posters are the size of a standard trading card (2.5″ wide by 3.5″ tall). 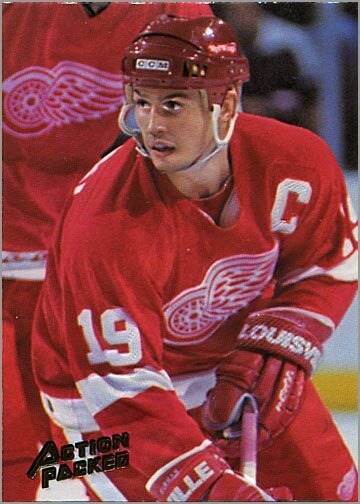 The photograph on the front is embossed like a bas-relief, with certain elements — such as the hockey stick, helmet and logo — slightly elevated off of the surface. 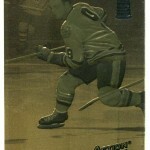 In the lower left corner is the Action Packed logo, embossed in gold. 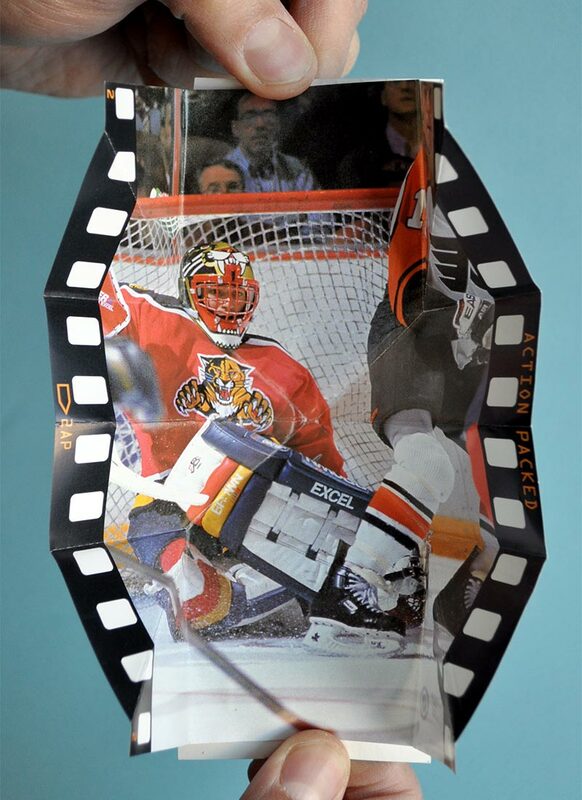 But when you pull the cards apart along the bottom edge, they unfold into posters measuring 5.75″ wide by 6.5″ tall. 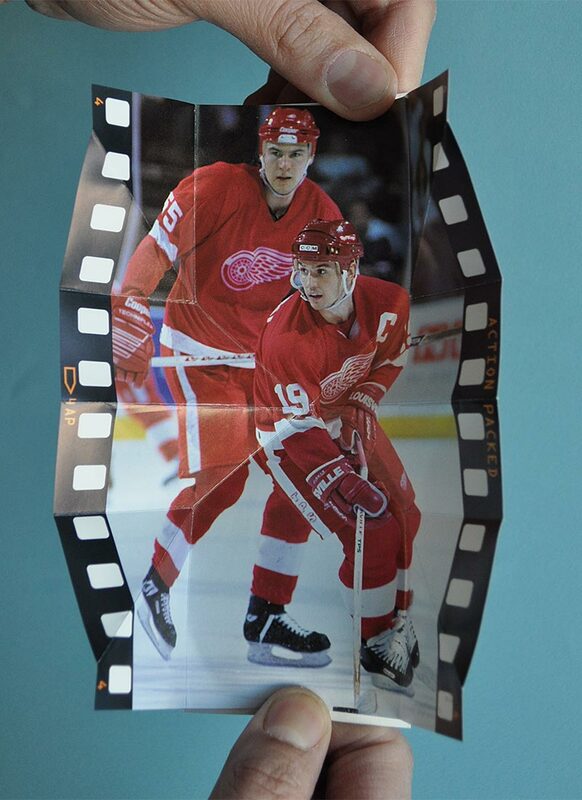 Each poster shows a bigger version of the photo that is used on the card front; hence the name Big Picture. The posters are designed to look like a frame of motion picture film, or a photography negative (though a true negative would have reversed colors). The left and right sides are bordered by sprocket holes. For those who never used an analog camera, small gears (sprockets) inside the camera fit into the sprocket holes in the film, and pulled the film forward to advance it to the next frame. Usually, the film would have the name of the manufacturer and frame number printed along the edges. 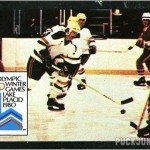 Here, that is replaced by the card number on the left and ACTION PACKED on the right. Back in the day, these would have been right up my alley, as I was taking photography classes in college, and would have enjoyed the film frame motif. Unfortunately, the posters can only be viewed while holding them open, and do not lay flat. The posters are impossible to display without tearing them from the cardboard sleeve that holds them. 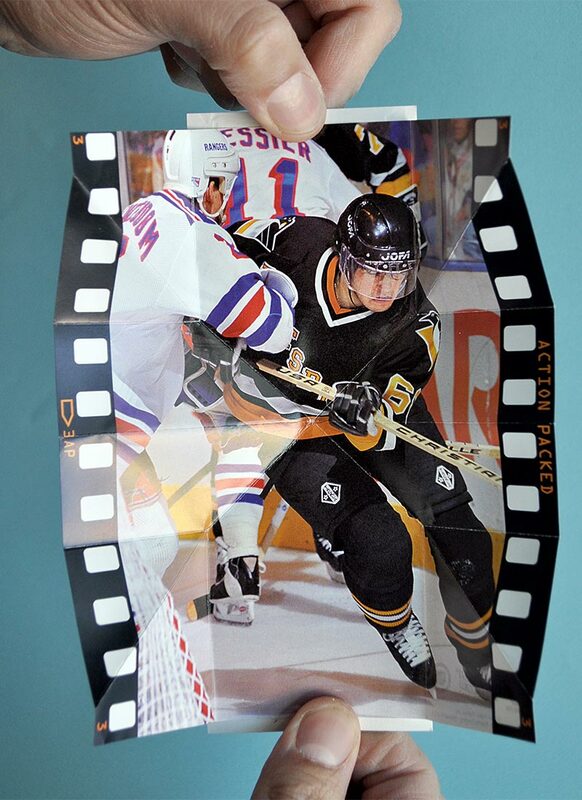 The back of the Big Picture cards have a head shot of the player, along with a description of the action going on in the poster photo. 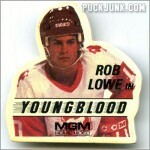 The player name, team name and circle around the portrait are all printed in gold foil. 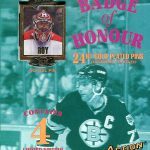 Supposedly, one in every 96 packs would have contained a poster that used 24-karat gold leaf in place of the standard gold foil. Big Picture would have come in cellophane and cardboard packages containing four random posters. Sealed packs containing four promotional posters were given to retailers. 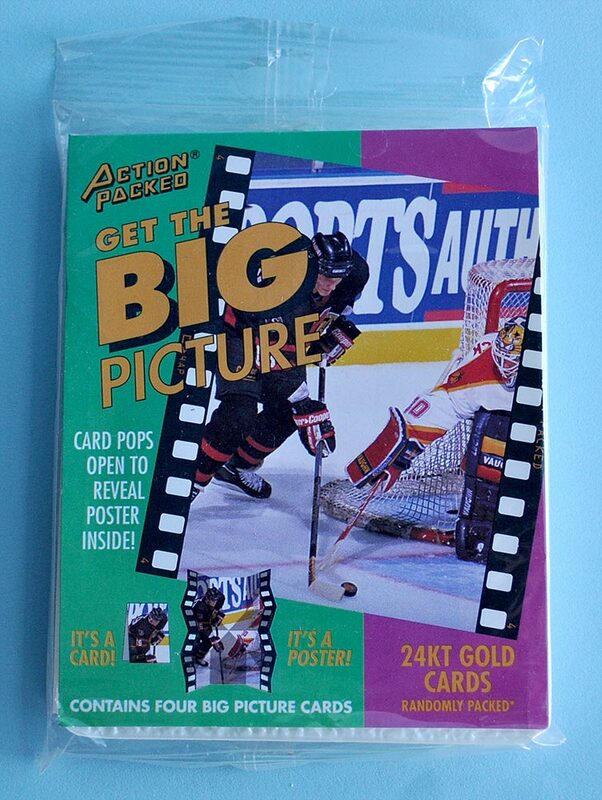 The top of the package has a punch-out hole, meaning that if Big Picture was sold in stores as planned, they most likely would have been hung from a rack, and not sold out of a display box like traditional trading cards. 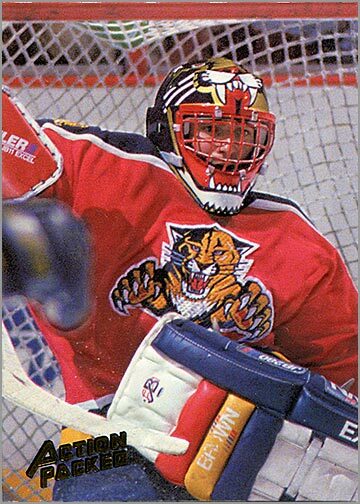 The front of the package pictures Alexi Yashin of the Ottawa Senators trying to score against Jon Vanbiesbrouck of the Florida Panthers. 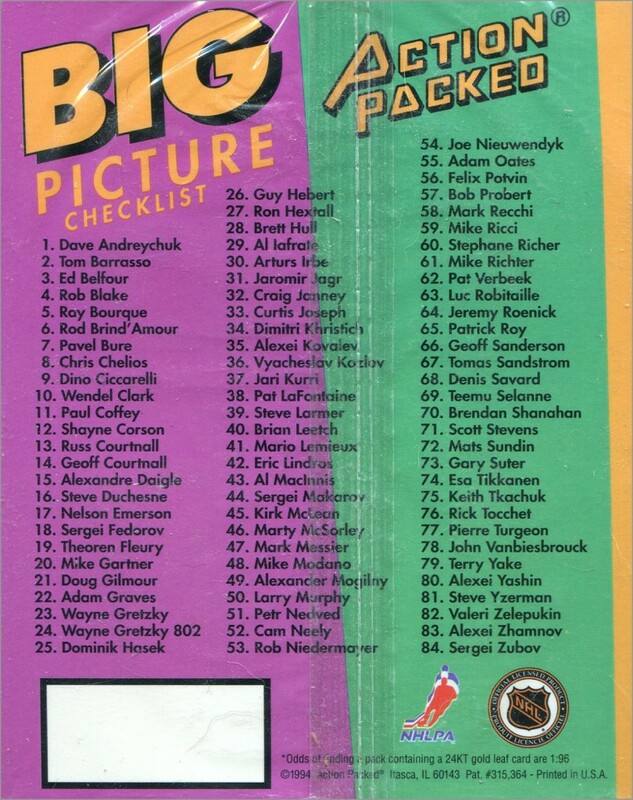 The back of the packaging has a checklist of the 84 different posters that would bave been available. 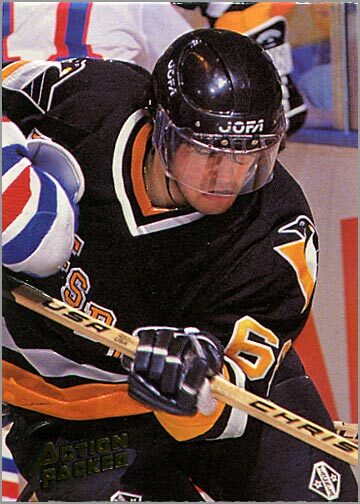 Wayne Gretzky would have had two different posters — a standard poster, and one commemorating his record-setting 802nd career goal. 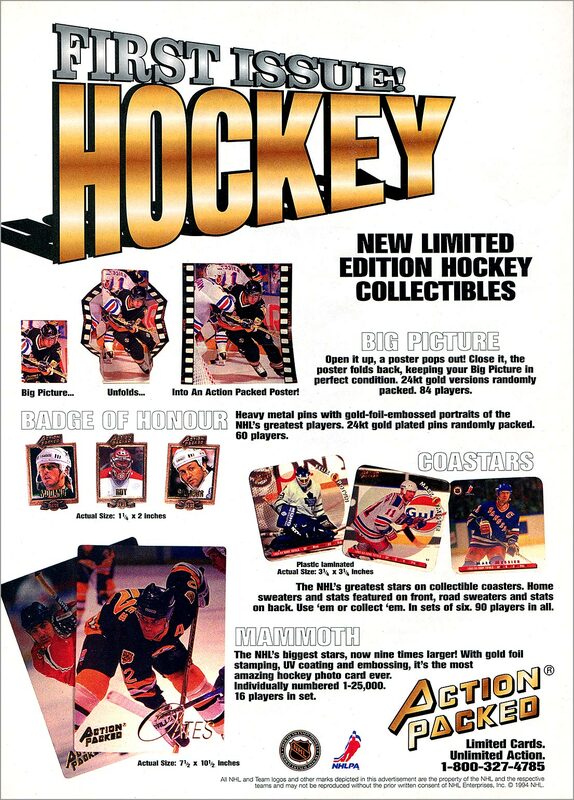 In late summer and early fall of 1994, Action Packed advertised Big Picture, along with three other products that never materialized, in full-page ads that ran in magazines and comic books. 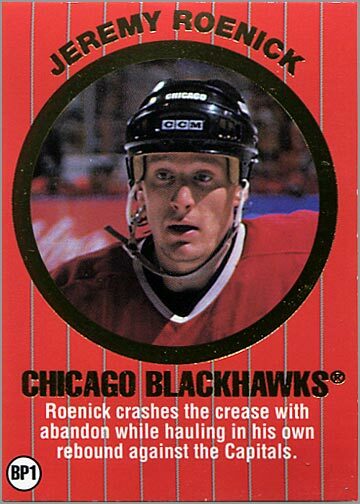 But just like Action Packed’s proposed set of Hall of Fame trading cards, Big Picture never materialized. Nor did Mammoth, Badge of Honor or CoaStars, but those are stories for another day. 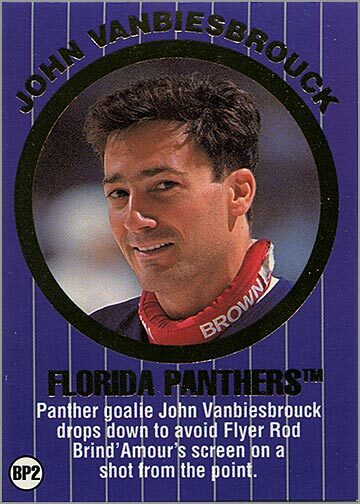 So all we are left with are four promotional posters: Jeremy Roenick, John Vanbiesbrouck, Jaromir Jagr and Steve Yzerman. Below are the front, back and inside of each Big Picture promo poster. Fold-up posters may seem like a strange collectible by today’s standards, but back in the 1990s, the NHL and NHLPA would seemingly license anything so long as their check cleared: action figures, porcelain statues, dozens of video games, pogs, magnets, toothbrushes, and collectible card games. So gimmicky posters fit right in with the times. Question: Is Big Picture a product you would have collected had it come out during the 1994-95 season, lockout or otherwise? What about today? Would you purchase a product like this now? 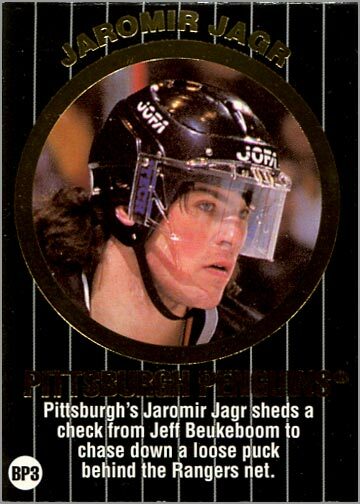 Of course, I would have bought this back then — I bought anything and everything hockey in the 1990s. I’m curious to know if you would have too. I probably would have collected these as well (with the mistaken belief of future capital gains). 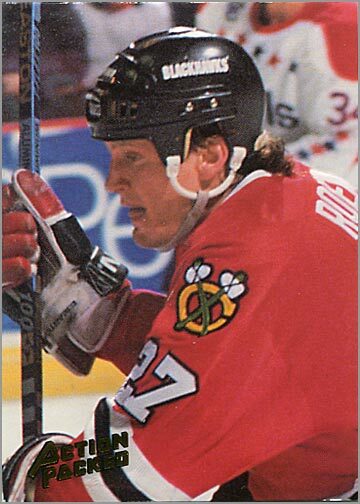 As you stated, this is indicative of the 90s junk wax era when they would slap a photo of a hockey player on anything. 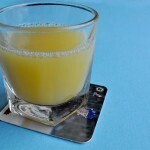 Anyways, I really enjoy your articles on oddball items from the past. Thanks for reading. I have some other oddball stuff that I will hopefully put up here over the next few weeks. I probably would’ve went for these back in the day. My boy Graves is in the set, so I definitely would’ve. 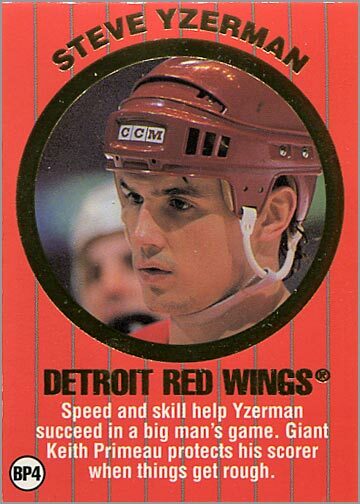 And on that card of Yzerman, Primeau looks like a giant!